My BrickLink order from Sk8rs Bricks came in today much earlier than I thought. That envelope was filled with pieces I needed to get that Lego building backdrop up to a presentable state. 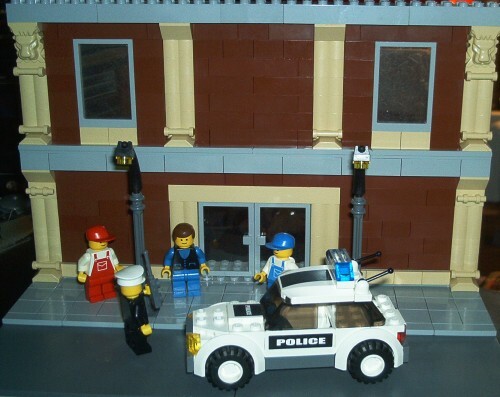 The whole point of building it was to be a backdrop for minifigures but schemes of how to improve it became more important than the custom minifigs. I don’t have the high pockets or spare room of those cats you see making even the medium-sized set-ups, that backdrop is only three bricks thick. Yeah, those buildings on floor two are only for show right now. On the plus side, these modified plates that I used allow figures to easily stand on the building ledges. Thanks to Lego’s decision not to use that kind of window much, I’m still undecided on adding a 3rd level to it. I don’t know what it was, but something about working with Lego seems to help the creative gears in my head turn. I think it’s one of the things that helped get me through that artist’s block crap I couldn’t shake for so long. I may have lost the ability to act stuff out with toys, but building with them still blows cobwebs off of brain cells that I use to draw. On a side note… I really need a better camera. Dang, those photos look kinda chunky. 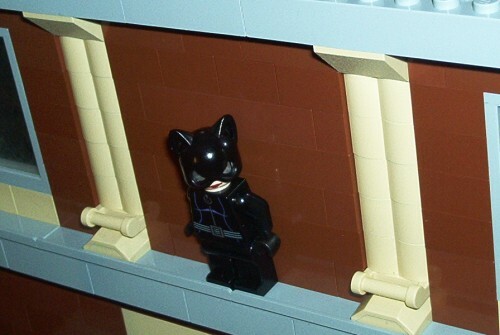 Yes, that’s the real Catwoman Lego minifig. What’s even more cool is that her head has the goggles version that works with the mask and a non-goggles version of her face on the other side of her head. You can get some black hair and show the non-goggles face for an unmasked Selina Kyle. That’s pretty cool and I’ve actually liked the newer Catwoman look too. I wish I would have gotten my hands on some of these sets before. That’s not a bad deal for that set too and the set with Nightwing (Arkhan Asylum) is a lot cheaper than I thought it would be. I might have to buy that when I get paid sometime. Thanks for the link BTW.